WASHINGTON (KGO) -- The country's Commander-in-Chief imitated a famous feline's face. It happened Friday in Washington as President Obama questioned why Republican politicians are so down on America. "They are gloomy. They're like, they're like Grumpy Cat," Obama said, while making a face, prompting laughs. 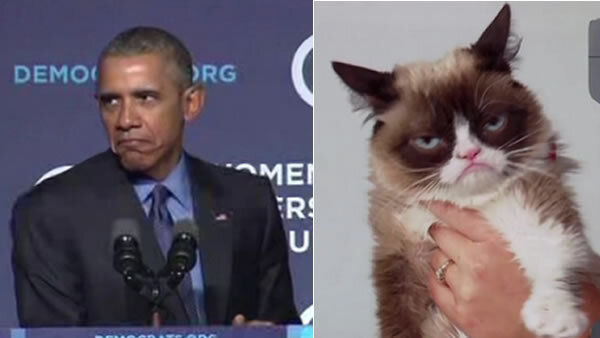 That laughed proved the president did a pretty good impersonation of America's beloved cat with the constant frown. But is it considered impersonation when it's a pet? Obama was speaking at the Democratic Women's Leadership Forum, reiterating the progress the party has made during his administration.